Hour change down under really puts me away from the top. Will really be bad when our clocks go back in a few weeks! Hi all. Nice green photo. Visited the Gardens many years ago. Absolutely wonderful! Gorgeous photo! Just dropped in quickly for a break - my desk is staring at me with PILES of papers that I must get to. A quick hello to the earlier posters and a 'have a good day' to those of us laggards! 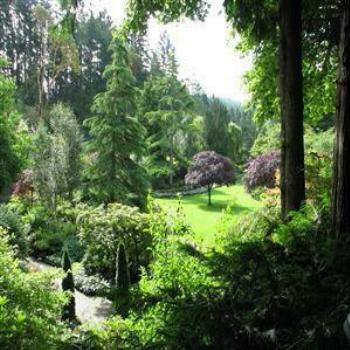 Today's solving tip: 9-&GT;1 reveals a lush green garden photo - lovely! All ready for a 22-pounce! Thanks for the solve tip, Joyce. Whatever is outside your window, have a grand day! Morning all, tip for the day: if you wear glasses put them on before starting the puzzle. I could see where I had gone wrong when I put my glasses on. Lovely green garden is the reward for today. But the yard is a mess. Nothing serious, just messy. Guess I have some work to do this weekend. I'm glad the damage is minor Hal and I hope all the other Sudokuists have escaped damage entirely. Out of town, and busy, so this is the first chance I’ve had to drop in and say Hi. You’re so right, Denny. Tough to get here at 6:00 AM, and even tougher to get here at 5:00 AM after we go back to standard time. Just one more reason I like Spring and Summer better. Beer time - make mine a Fat Tire. That beer made me sleepy. So, I think I shall retire for the day. Night all. Just (almost) finished a very hard jigsaw puzzle that I started over a year ago, although I'm waiting for a missing piece my granddaughter took home to trick me. I didn't work on it much until just lately. It is of the Bungle Bungle, or Purnululu, in the Kimberleys. I love doing jigsaw puzzles but this is by far the hardest one I've ever done. I now hope to have it framed like I did with one of MachuPicchu in Peru. My next one which I bought recently is of St Basil's Cathedral in Moscow. They are all of places that I have visited over the past few years.